Orphan Black goes back before the beginning in its season premiere to explore the last days of Beth Childs, who we first saw step in front of a train in the series’ pilot episode. Beth is in a serious downward spiral. She’s fraying at the edges and it’s obvious to everyone in her life. Her relationship with her monitor/boyfriend, Paul, has lost all hope of intimacy, so she is seeking love and solace in the arms of her partner, Art Bell. She’s running two investigations into her cloned nature: one with Cosima and Alison and another with a confidential clone informant, MK, who we haven’t met before today. Her fellow cops don’t trust her. To cope, Beth is using a variety of pills and booze to manage the pain. She is led to a corpse in the woods who is covered in body art, body modifications and has a sizeable hole where his cheek used to be. MK points Beth in the direction of a Neolutionist nightclub where she questions a pregnant employee. After a tough night with Paul, Beth ends up on Art’s arms. The pregnant club-goer calls Beth in the middle of the night worried about her boyfriend, who went off with a couple of Neolutionists, after he complained of a problem with one of his implants. Beth tracks down where the guy went and spies two Neolutionists removing his cheek and pulling out one of those creepy cyber-grubs we saw from last season as well as a familiar face from her precinct. Beth makes too much noise and alerts the people inside. She manages to escape, but in her heightened state, Beth wheels and fires at a noise behind her. The noise was made by Maggie Chen, who we will later learn is Helena’s Prolethian handler. Beth is in even deeper now that she’s shot a civilian, asked Art for help covering it up and her union rep, Det. Duko, is the same man she saw in cheek surgery room. She is a new clone who is highly scientific and highly paranoid. She has a ton of information about Project Leda and was the one who started Beth down the rabbit hole with all the clone stuff. She has been slowly parsing out information to Beth, but her own fear of Neolution is getting in the way of any meaningful discussions with Beth. 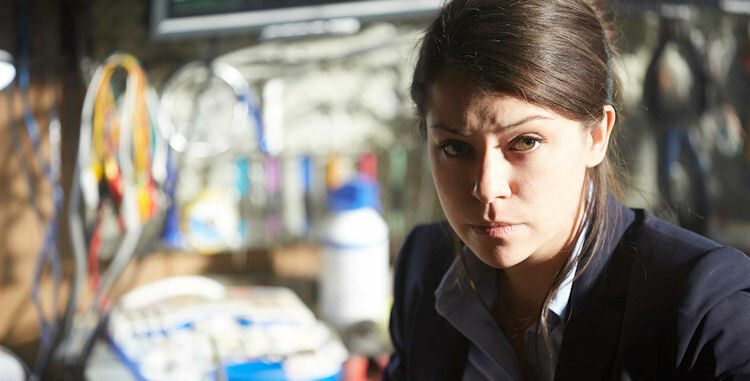 We catch Cosima as she’s transferring schools to help make the Clone Club’s research easier. She’s kind of in a hurry to leave since she just broke up with her girlfriend, who we can only assume was her ex-lab partner. In the stinger of the episode, we come back to the present. Sarah and Kira are all snug in their bed in Iceland like the happy family they are. She is awakened by a call from Art, who has a person with a message for her. It’s MK, still with her Dolly the Sheep mask, and her message – bad people are coming for her right this minute. She needs to get out now.